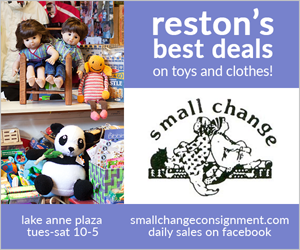 The Farmers Market returns to Lake Anne tomorrow after a brief hiatus due to the Reston Multicultural Festival. As wonderful as that was, we missed our weekly cheese fix from the Cherry Glen Goat Cheese booth. Cherry Glen is a 58-acre farm in Boyds, Maryland that raises goats and makes a wide variety of award-winning, soft-ripened goat cheeses. 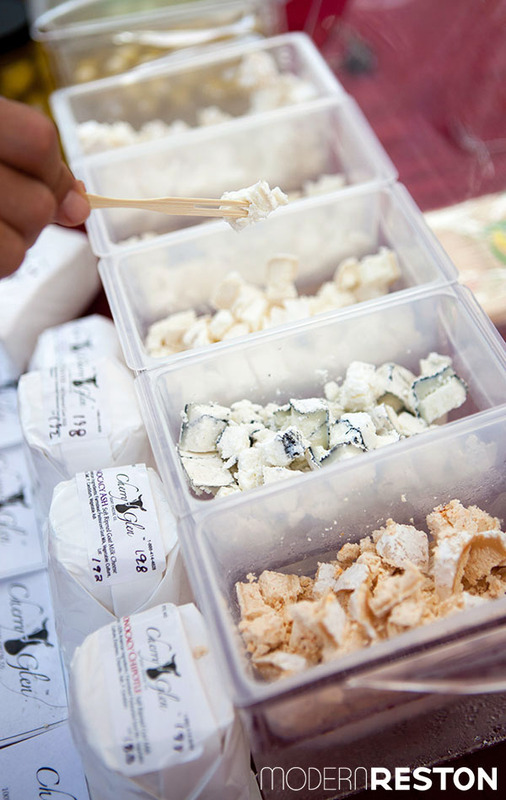 Goat’s milk cheeses are more acidic and bright in flavor than cow’s milk cheeses. They are tangy and slightly sour and go well with foods such as pecans, fruits and bitter greens. Goat cheeses are also lower in fat, calories and cholesterol than cow’s milk cheeses but are still extremely rich and creamy. Chèvre This hand-dipped fresh chevre is soft (similar to cream cheese) with a distinctive tangy flavor. Although delicious as is, try adding herbs and other flavorings to this cheese or spread on toast with a drizzle of honey. Ricotta A mild and naturally sweet Ricotta. Monocacy Crottin Cherry Glen’s version of a traditional French Crottin that is mild and creamy when young. As it ages, full goat cheese characteristics come forth, tangy with a long, nutty finish. This cheese is great served warm on a salad or as a starter for a cheese plate. Monocacy Silver A cylindrical shaped cheese with a white mold exterior. More tangy and flavorful than most Brie but ripens to a similar creamy internal consistency. As with Brie, you can eat the rind with the cheese. Monocacy Ash This two-layer cheese is very similar to the previous cheese, but has an edible ash coating and ash line through the center. Using the same culture as in the Silver, this more complex cheese tastes slightly different due to the alkalinity of the vegetable ash. Monocacy Chipotle This cheese has the same format as the Silver and Ash. It’s smoky and has a wonderfully spicy finish. It is perfect for a savory breakfast strata or tart. Monocacy Gold The curd for the Gold is drawn at higher pH than the Silver or Ash. This delicate, mild-flavored cheese is smooth and silky. Sprinkle generously with dry crushed fennel and enjoy on crusty bread. 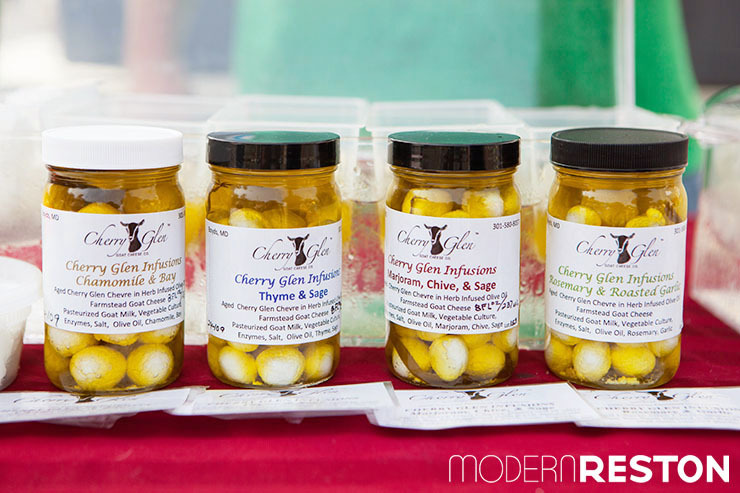 Cherry Glen also infuses their chèvre in herb-flavored olive oils. These are truly decadent and don’t last long in my house! Consider these as host/hostess gifts (hint, hint—friends) as the holidays approach. If you happen to miss the Farmers Market—don’t fret—Whole Foods often carries Cherry Glen Goat Cheese. While I am partial to my beloved Crottin, the classic chèvre is extremely versatile. Spread it on toast, sprinkle on salads, add to an omelet or quesadilla… the list goes on. 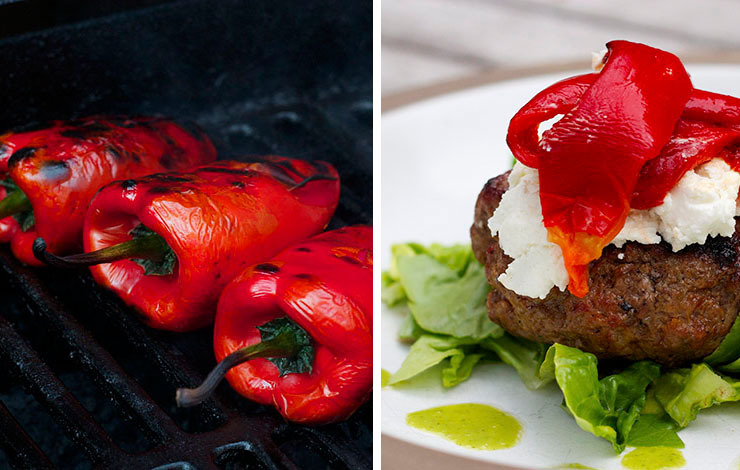 Here are two suggestions for easy weekday dinners. This is a recipe from Giada De laurentiss. We have made it and it’s excellent, however if you don’t have time on a random Tuesday night to make pizza dough the pre-made dough from Trader Joes will also do the trick. Put the water in a small bowl. Add the yeast and stir until dissolved. In a large bowl, whisk the flour and salt together. Add the yeast mixture and stir until a soft dough forms. If the dough is too dry, add a little extra water, 1 tablespoon at a time. If the dough is too sticky, add extra flour, 1 tablespoon at a time. Transfer the dough to a floured work surface. With floured hands, knead the dough until it becomes smooth and elastic, about 10 to 12 minutes. Drizzle the inside of a clean bowl with olive oil. Put the dough in the bowl and cover loosely with plastic wrap or a damp kitchen towel. Set the bowl in a warm, draft-free place, until the dough has doubled in size, about 2 hours. Using a fist, deflate the dough in the center and cut it into 3 equal-sized pieces. Form the dough pieces into 3 balls and put into 3 oiled bowls. Cover each bowl loosely with plastic wrap or a damp kitchen towel and let rest for 1 hour. Use according to your recipe or wrap in plastic and refrigerate for up to 1 day. Caramelize onions in a pan, set aside. On a floured surface, roll out dough to 1/2 inch thickness. Spread chèvre carefully on dough leaving a one inch border for the crust. Press cheese with hands for even coverage, careful not to tear dough. 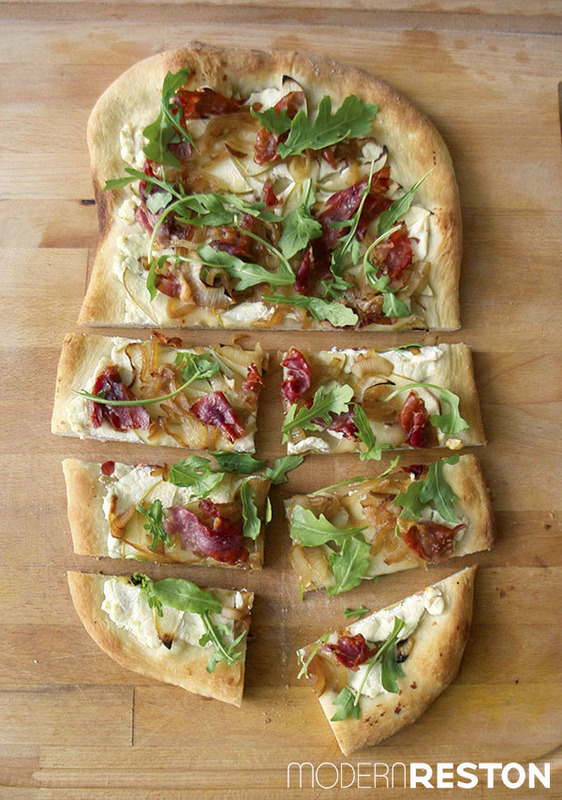 Arrange apples over goat cheese, then onions and finally prosciutto. Bake in oven until crust is golden. To serve, top with arugula, drizzle with olive oil and sprinkle with salt. 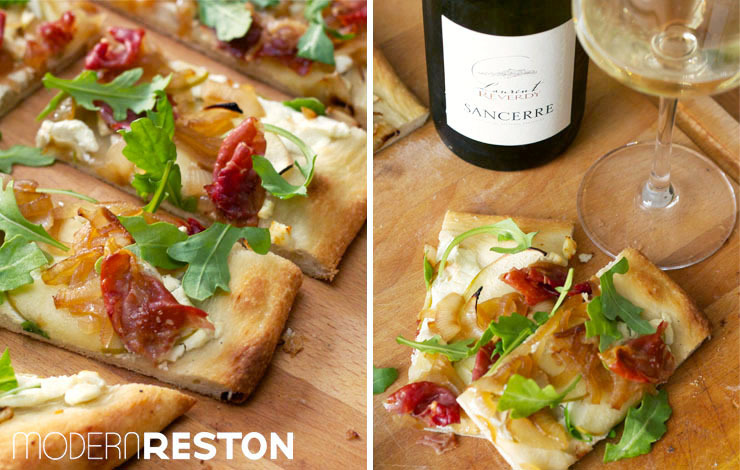 Pair with a dry white wine such as this Laurent Reverdy Sancerre from Trader Joes or any Sauvignon Blanc. Grill (or broil) poblanos turning them frequently, until skins are blistered and charred, 8 to 12 minutes. Transfer peppers to a bowl and let stand, covered, until cool enough to handle. Wearing rubber gloves, peel peppers or chiles and cut off tops. Discard seeds and ribs. Slice. In a large bowl, combine the ground chuck and generously salt and pepper. Form into 4 equal patties. Grill the burgers to your desired doneness, 4 to 5 minutes per side for medium-rare. Remove the burgers from the grill and let rest for 3 to 4 minutes. Top with chèvre, poblanos and serve atop butter lettuce. Drizzle with Honey Cilantro Vinaigrette. In the bowl of a food processor, combine all ingredients. Process until smooth and uniform. Transfer to a jar and use immediately or cover tightly and refrigerate up to one week.